There isn't anything original about a skier on a road trip out West. Even living out of your vehicle is no longer rare or different. And yet Jack Van Wie's decision to load his 1982 Saab 900 with his telemark skis, eight pairs of socks, a fire extinguisher, and his books, and spend the winter touring his way from New York to Washington feels unique—like a throwback to a time when we didn't make our decisions based on current trends. When we didn't document every powder turn on social media, or leverage our adventures for personal gain. The 21-year-old from the Adirondacks headed out with one pure motive: Just go skiing. 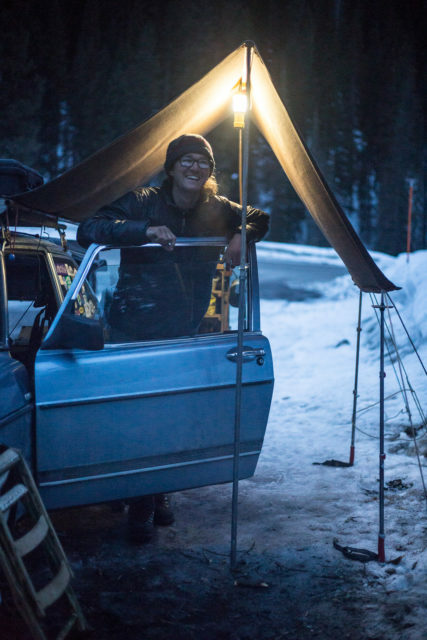 From early January to mid April, he slept in parking lots and backcountry access points, cooked on a camp stove, and scored more than 100 days on skis. Sierra: You know they make vans for trips like this, right? What's with the tiny Saab? Jack: First of all, it's not tiny. Before I decided to live in it, every time I stopped for gas or a sandwich, someone would come over and say, 'I had that car,' and give me their story of how they used the car as a pickup truck or something. When I fold down my seats, three people can sleep comfortably in the back. It looks small, but it's not. It's front-wheel drive and it's an amazing car in the snow. I never even put on my chains. How many miles did you put on your car anyway? The odometer broke down before the trip, so I'm not sure. But for the most part I never took a highway. It's boring to drive on a four-lane monstrosity forever. My excuse is that my car is old, but really I don't like the idea of blurring through everywhere. Why skiing? Why not take a trip in the summer? What's on the menu when you're car camping all winter? A lot of dried soups. But my main thing was frozen tots and fries. I'd fry them up with butter and melt cheese over the top. At the end of the day, when skiers are coming out, no one will ever turn down fries. Half the time they'll give you a beer for it, too. How did you make friends on the road? I offered them Tater tots. Might have been my lone guy, weirdo vibe, but I found once I broke the ice and invited people into my space, they were very nice and wanted to talk. I've always felt like an introvert, but when you are separated from people and going days without talking to anyone, when you do talk to someone you're like, yes—finally! So you're saying skiers are friendly? I think people are inherently good and the trip definitely reinforced that belief. The skiing community is something I could rally around. People gave me food, beer, let me borrow their skis when my binding broke. Skiers are a small community and it's a group that helps each other out. I hope to pay that forward. Smart man. What did you learn about skiing on this trip? There's all the technical stuff. But it also reinforced for me that skiing is shared love and any shared love brings out the best in people. It doesn't have to be a big, expensive thing. You can do it on a shoestring budget and just get out there. You can make due and enjoy it. The people having the most fun are the ones just getting out there, smiling. You were on telemark skis this whole trip. What gives? Tele skiing is quality skiing. It's mostly dads and grandpas, but they're on my schedule and that's my style. In college I took a movement course about being aware of your body in space. It made me think about my turns and my body motions and angles and stresses and where the force is going as I'm skiing and turning. Tele skiing is like dancing on the mountain. Everything about it is perfect. So on your next trip are you taking the Saab? It needs some love, but it should keep rolling. This interview was first published in the September 2016 (45.1) issue of POWDER.